It’s starting to feel like winter again in Wisconsin. Snow is in the forecast with 2-4” expected tomorrow. We’re busy working on everyone’s harvest data and getting set-up data cleaned up and ready for spring in Apex. Check out our UPDATED Data Management Service if you do not have Apex software or if you would prefer that we do everything for you. For $500/year it will save you a lot of time to get everything in place before planting season. You can view more info on our website by clicking here. Have you taken the time to remove your displays and receivers and put them in a temperature controlled room for the winter? It’s a good idea to do this. Think of your display as a laptop. Would you leave it in the shed all winter collecting condensation every time the temperature increased or decreases dramatically? Mt. Horeb recently sold a 6125R to Northwoods Passage snowmobile club near Tomahawk. This is the club’s second John Deere tractor. When Soucy tracks are added, they claim that they get around the trails and deep snow better than anything else that they have. They are also way more reliable with less downtime and repair expenses for the club. 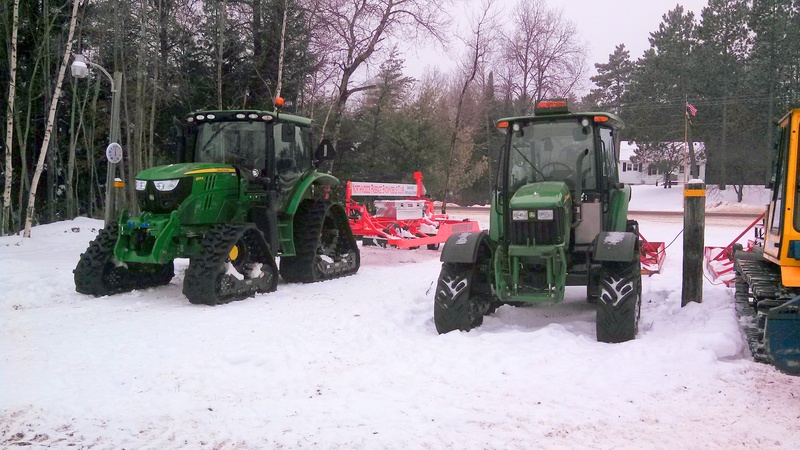 Contact Jeff Stone in Mt Horeb at 800-828-4240 for more information on these tractors.